News flash: Wild Noodle has introduced a candidate assessment service for recruiters. The assessment test will assess a candidate's programming abilities, and in particular their ability to learn quickly, solve problems, and employ various programming techniques to produce correct and efficient programs. Unlike other assessment tests, our assessment test is language independent, fun to take, and can be completed in just 30 minutes. The tool will provide recruiters with a quantitative assessment for each candidate which has been proven to be correlated with subsequent job success. Sign up today using the form at right! Technical recruiting is tough. It’s a continual scramble to find the best candidates, assess their abilities, and once you determine they are a fit, convince them to accept your offer and ensure they are retained. Wild Noodle’s services help streamline all phases of the technical process, allowing technical recruiters to be more efficient and effective. In most cases, recruiters rely on job board searches or ads, job fairs, or personal networks of job seekers, to source candidates. The problem with this is that this largely limits the pool to those actively looking for a job. Wild Noodle solves this by running regular technical competitions that attracts the best talent, whether or not they are currently on the job market. Participants in contests tend to be those engineers looking to challenge their abilities against their peers – exactly the profile most hiring companies prefer. According to a recent LinkedIn study, the two most important characteristics for a technical candidate are general problem-solving capabilities and the ability to learn new things. Unfortunately, neither of these can be determined from a resume or application. Instead, recruiters tend to screen based on secondary characteristics like experience and programming languages stated. Wild Noodle provides the only language-independent problem-solving test for technical candidates. Wild Noodle tests are based on a simplified programming language that contains all the important concepts of industry programming languages, yet can be learned in minutes. In order to pass the test, you need to understand basic programming concepts, be able to learn a new language quickly, and have excellent programming problem-solving skills - exactly the qualifications needed to succeed at high tech jobs. The best candidates will get multiple job offers. The challenge is making your company stand out from the crowd. Wild Noodle helps companies do that by running branded competitions for them (for example, the XYZ Coding Challenge) and offering other sponsorship opportunities. This gets your company’s brand in front of your candidates early and often and associates your brand with technical excellence. 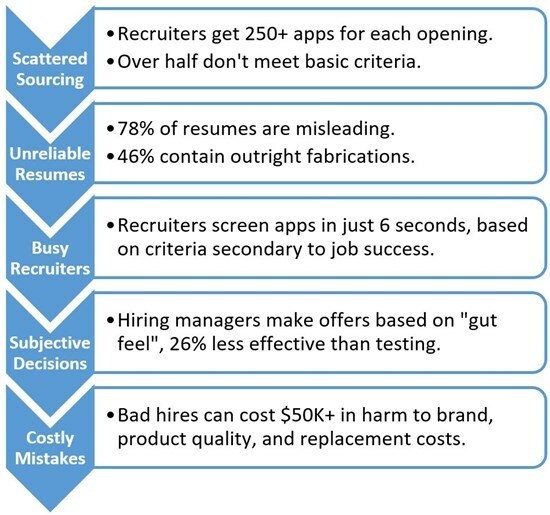 Bad hiring decisions can cost companies tens of thousands of dollars, in terms of harm to its brand, product quality or timeline, in impact to a high-functioning team, and ultimately in the cost to replace poor performers. That’s why it’s essential that the decisions you make are sound. Making decisions based on assessment tests like Wild Noodle’s have been shown to be 36% more effective than decisions based on the gut feel of the hiring manager. And a 12 year-study found a strong correlation between the Wild Noodle assessment score of a candidate and their subsequent job performance. Test 10 candidates for free. No credit card needed. Start today.